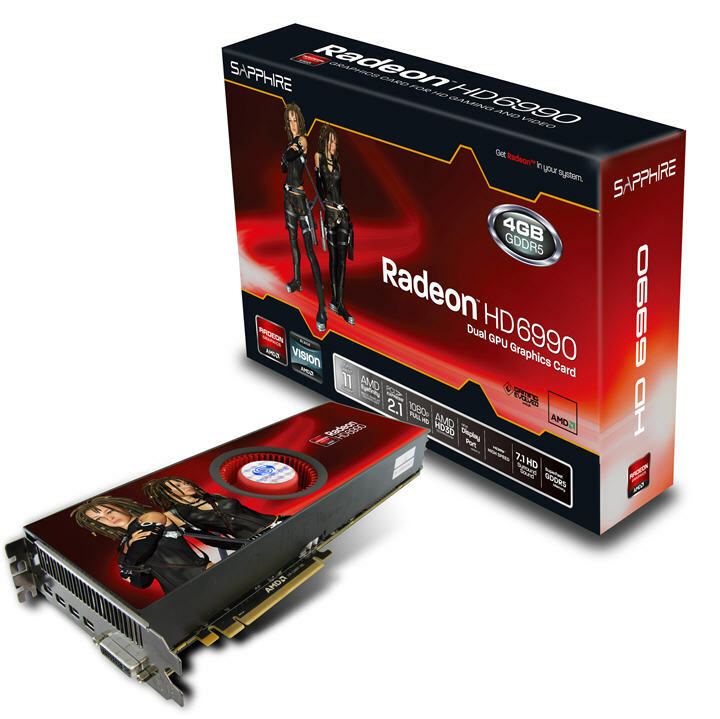 SAPPHIRE HD 6990 Delivers Top Performance and Features. Dual GPU card is fastest yet! Dual GPU card is fastest yet! SAPPHIRE Technology, the largest manufacturer and supplier worldwide of graphics solutions based on AMD technology has just added a new top-of-the-range model bringing record performance levels to the recently launched HD 6000 series - the SAPPHIRE HD 6990. The new SAPPHIRE HD 6990 is a dual GPU card featuring the latest architecture from AMD providing massively parallel computing power for graphics and other accelerated applications. It is fitted with 4GB of GDDR5 memory clocked at 1250MHz (5.0GHz effective). A key feature of this card is a switch selectable dual BIOS, which allows the user to chose a core clock speed of 830MHz for Performance or 880MHz for Extreme use. AMD PowerTune - a dynamic power management feature first introduced on the HD 6970 - enables the HD 6990 to deliver maximum performance whilst operating within a power envelope of 375W (Performance) or 450W (Extreme). Dual 8-pin PCI Express power connectors are fitted to support the Extreme setting, and users are advised to ensure the system is fitted with an adequately rated power supply to support this mode. The SAPPHIRE HD 6900 series features the latest graphics technology from AMD designed to support all the features of Microsoft DirectX 11 and DirectCompute 11. The GPU’s are built in AMD’s 40nm process to deliver high performance with low power consumption. Advanced hardware features include an enhanced Tesselation unit, with up to three times the performance of the previous generation and new AA and image filtering options. It has dedicated HDR Texture compression, supports multi-threaded communication with system CPU cores, and has embedded support for many of the DirectCompute 11 instructions, 3D stereoscopic support and HDMI 1.4a. The HD 6990 has one DVI, and four mini-DisplayPort outputs, supporting up to five screens in Eyefinity mode. With the future release of the DisplayPort v1.2 drivers, it will be possible to daisy chain additional DisplayPort v1.2 monitors from each DisplayPort output. Two mini-DisplayPort to DVI adapters and an HDMI adapter are bundled, allowing a wide choice of monitor configurations to be used. Like previous generations, the SAPPHIRE HD 6900 series has an on board hardware UVD (Unified Video decoder) - this technology is now in its third generation, considerably reducing CPU load and delivering smooth decoding of Blu-rayTM and HD content for both VC-1 and H.264 codecs, as well as Mpeg files, and support for Multiple View Video Coding for Blu-Ray 3D. The SAPPHIRE HD 6900 series is supported by AMD’s DirectX 11 WHQL certified graphics driver which delivers support for all of the key DirectX 11 level features required for enhanced gaming experiences as well new configuration options and GPU acceleration of supported applications.